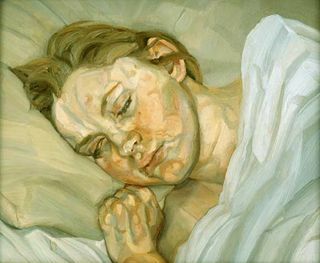 Just watched an amazing doc on the portrait painter Lucian Freud. Saw some of his works at the Tate Modern when I was there but this documentary focused on his models and their experiences while sitting for him which takes months and months of daily sittings for 3-6 hrs at a time. Lucian spends so much time with each model he is able to develop a connection with them which in turn translates directly to the canvas. Sometimes the end result is not a flattering portrait, however it is most certainly what the painter saw and experienced during the time spent in each others company during the painting sessions. I love how each work seems to represent an entire period for each model in their personal life. So much time passes from the time they begin the painting till the time the work is actually finished it becomes an emotional marker for a segment of the model's life.